As a lover of Reese’s Cups and all things Peanut Butter and Chocolate, I’m so happy to share one of our FAVORITE chocolate cake recipes~ a Peanut Butter and Chocolate Cake from scratch! There are countless amazing flavor pairings when it comes to chocolate cake, but peanut butter & chocolate tops my list! Make this cake once and your family, friends, or cake customers will ask for it again and again. It is just that good! All that you need is a great chocolate cake, a fabulous peanut butter frosting for your filling, and the perfect chocolate buttercream frosting. And guess what? We have you covered! Below, you will find recipe links to our tried and true Chocolate Cake, Chocolate Buttercream, and Peanut Butter Buttercream Recipes! You will not be disappointed, all of these belong in your recipe box! Let’s just take a second to stare …..
We made three (8 inch) cake layers of our Classic Chocolate Cake from scratch (linked below) which stand approximately 5 inches tall. Once cooled, we filled our layers with our favorite Peanut Butter Buttercream frosting, and frosted with a coat of dreamy chocolate buttercream which we combed with an Ateco cake comb for a ridged effect. Peanut Butter Buttercream rosettes were piped with a Wilton 21 star tip over the top of the cake, and we added a chocolate buttercream shell border with a 2D star tip. Finally, we finished things off with a healthy helping of mini Reese’s Cups. Heaven! Now it’s time to meet the stars of this Peanut Butter and Chocolate Cake Recipe! This is a compilation of our favorite chocolate cake, peanut butter buttercream frosting, and chocolate buttercream frosting below. Enjoy! 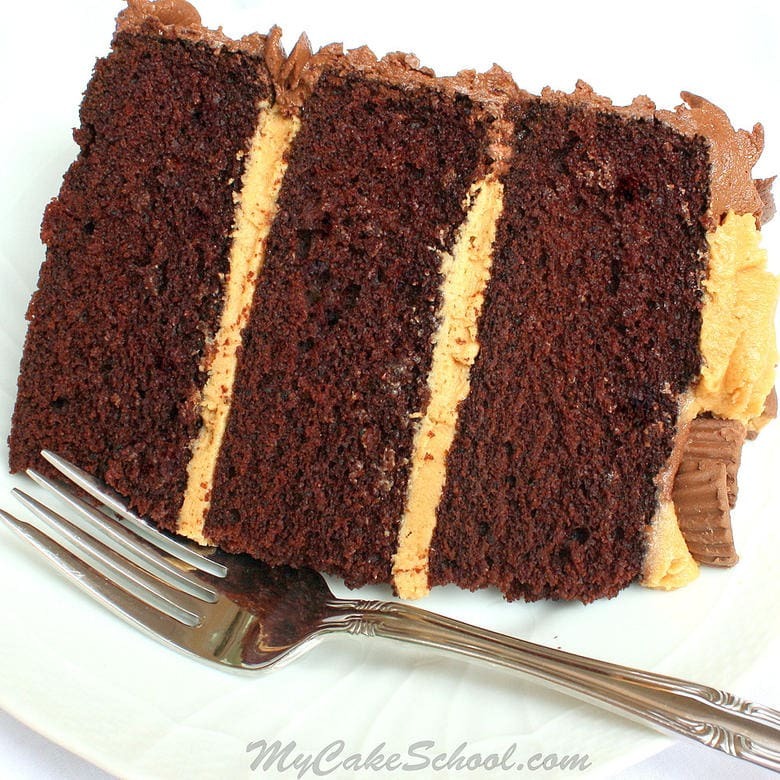 Peanut Butter Buttercream – **I make 1 1/2 recipes when using for this cake. This frosting recipe is peanut buttery perfection! I cannot be left alone with a bowl of leftovers. It is too good! 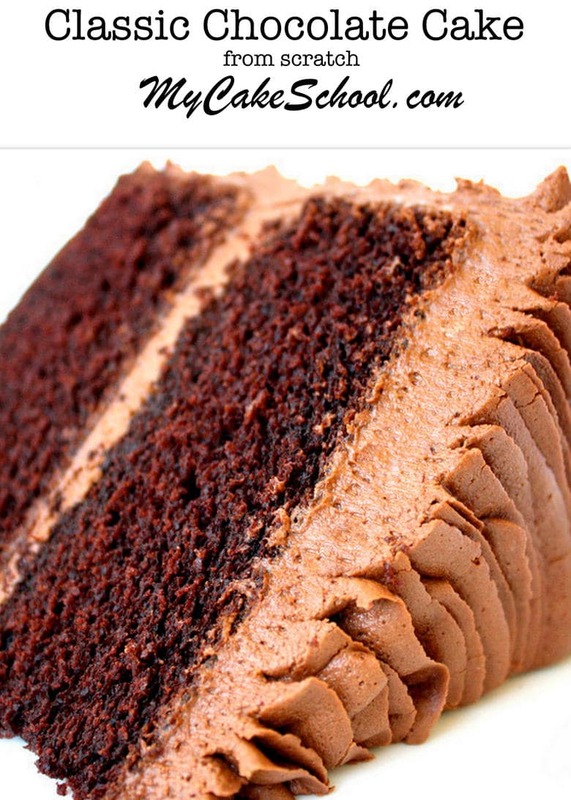 Classic Chocolate Buttercream – Perfect for this cake (or any cake for that matter!) Pipes beautifully, develops a light crust, and is completely addictive. 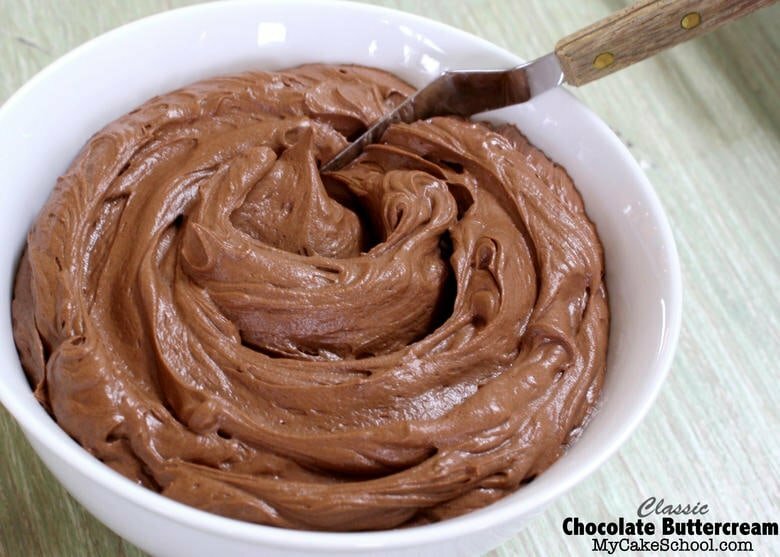 This is my go-to chocolate frosting! Thanks for stopping by! We hope that you’ll give this Peanut Butter and Chocolate Cake Recipe a try soon! It is always a crowd pleaser! « Our Favorite Scratch Carrot Cake Recipe! Looks yummy!!! Funny that you posted this, I’m working on a Chocolate, PB and PB Cup cake right now for my son. Except mine will be covered in fondant and be topped with a hand grenade – LOL! I hope my cake is as explosively yummy as yours!!! Just did lots of cupcakes in this flavor last weekend. Oh yes….this is a true favorite and crowd pleaser. It’s beautiful. My wife is a Reese’s Peanut Butter Cup girl. She love those things. I was pondering on what her birthday cake would be this year . 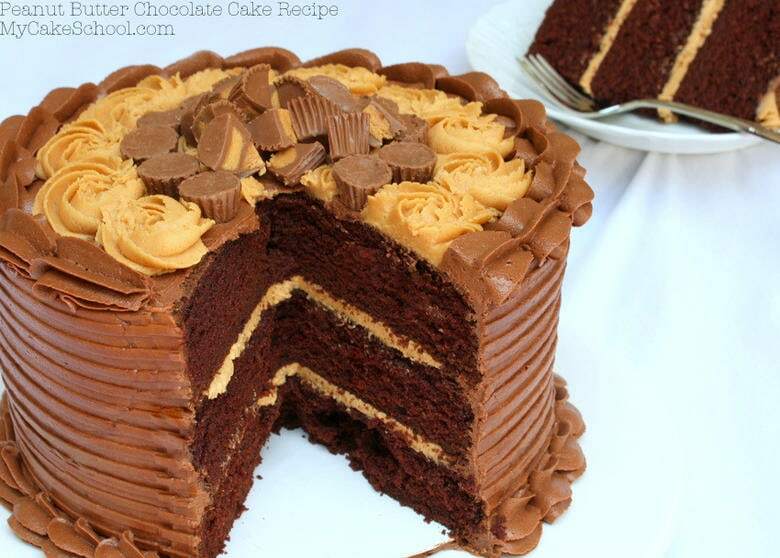 I love chocolate and peanut butter combined, and when it’s in a cake, heaven! This flavor combo was one of the tiers in my niece’s wedding cake. I got tons of compliments on it (as it wasn’t just a plain boring chocolate cake). I recently found Oreo cookies filled with Reece’s PB cups. I’m thinking those might be great mixed up with some buttercream for a filling. The peanut butter buttercream tastes just like Reeses!! OMG the cake looks devineeeeeeeeeeeee! with the liquid measurements are they in grams or ml – I really want to try this here in Aussie land. While I made this cake and it was absolutely delicious, my layers fell after they came out of the oven and were not thick looking like yours> Did I do something wrong? Some of my family loved this cake and some didn’t but the ones that did were having a fitting over how good it was. My son in law said, that was the best cake I ever made!! It was Pretty awesome but would have like my layers to been a little more thicker!! I have made 2 of these cakes since you posted it. At this point everyone has absolutely loved it. I am just wondering about putting a touch of pb flavoring in a chocolate cake. What do you think? Hi Marlene, we have not tried that but I think that could be a good idea. Let us know what you think if you give it a try. Wow, absolutely yummy cake.. love all your cakes..
the tops.. how to avoid it? This is a novice question :) but would I need to make a dam with the peanut butter buttercream for this cake or is that not necessary? Thanks! 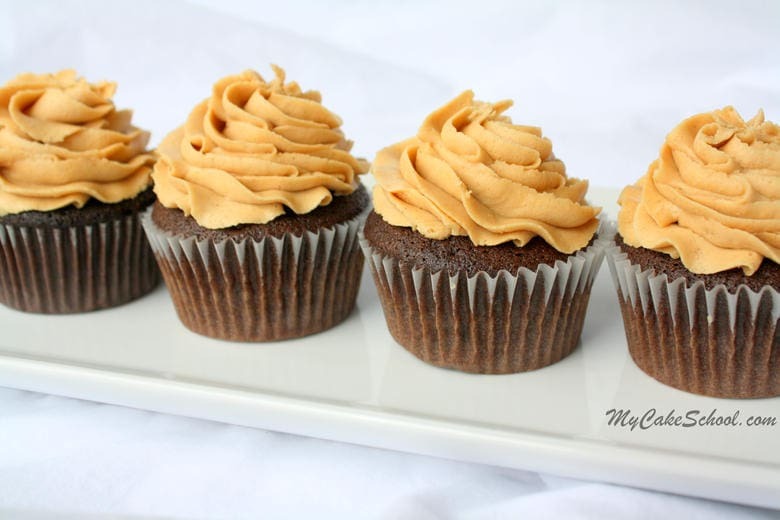 Hi MBM, You will not need t make a dam with the peanut butter buttercream. wah!!! It is very amazing!!! On my friend’s birthday I will recommend this cake to all my friends.